JOHANNESBURG, July 26 (Xinhua) -- Driving locomotives, exporting garments to other continents and setting up industrial parks ... The industrialization dream the African people have been pursuing since they attained self-rule decades ago is gradually being realized thanks to Chinese capital, technology and skills. Chinese firms have been investing heavily in industrial parks and special economic zones that have sprung up in many African countries, which are determined to diversify their economies and reap the benefits of globalization. It is widely-believed that China has played an important role in Africa's economic transition, wealth generation and job creation. 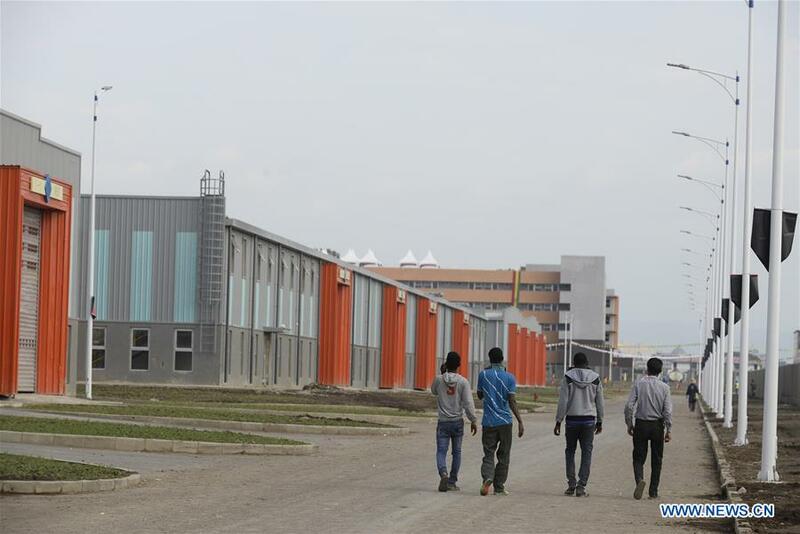 Ethiopia's Mekelle and Kombolcha industrial parks, set up by Chinese companies at a cost of 100 million and 90 million U.S. dollars respectively, have come to symbolize the East African country's ambition to become a manufacturing hub. The Hawassa industrial park, built by China Civil Engineering Construction Corporation and unveiled in July 2016, has become a model for attracting high-tech manufacturing companies in the textile and apparel sector. Chinese companies' investment certainly fits in the overall picture of Ethiopia's industrial development. Arkebe Oqubay, board chairperson of the Ethiopian Industrial Park Corporation, told Xinhua during a recent interview that more industrial parks will be set up to ensure that manufacturing contributes about 20 percent of the country's GDP and 50 percent of exports by 2025. Kenya, meanwhile, is also banking on Chinese investment in modern infrastructure to grow its manufacturing sector, with the Nairobi-Mombasa standard gauge railway serving as an example. The railway, unveiled in mid-2017, is considered a flagship of Kenya's Vision 2030, a development plan that seeks to drive the East African powerhouse into "a newly industrializing, middle-income country." The modern railway project, an early result of the China-proposed Belt and Road Initiative, will not only boost cross-border trade and regional integration but also invigorate Kenya's manufacturing sector, which contributes an estimated 10 percent of GDP. The China-funded modern railway is estimated to have boosted the African country's GDP by 1.5 percent and have created nearly 50,000 Kenyan jobs, according to official figures. The C&H Garments Ltd, a Chinese-invested enterprise producing African-themed clothes as well as uniforms for Rwanda's forces, has employed some 1,500 local people so far. Besides providing jobs, Chinese firms have also been helping the local workforce develop skills, having contributed to the manufacturing revolution in African countries, including Tanzania. Sunshine Industrial Company, based in Dar es Salaam, is one of the biggest investors in Tanzania's mining and manufacturing sectors. S. Krishna, a former small business owner who joined the Chinese firm in 2014, said he has benefited immensely from it. "Working with the Sunshine Industrial Company not only offered me a new set of business skills, but also changed my way of thinking," Krishna told Xinhua during a recent interview. Tony Sun, executive director of the company, said a limited pool of highly trained personnel is an impediment to the development of labor-intensive industries in Tanzania. "That is why professional training should be so important for every Chinese enterprise seeking to develop in Africa," he said. Diplomats, policymakers and observers agree that China-Africa industrial cooperation has a promising future and there is a need to nurture it for the long haul. Obed Bapela, South Africa's deputy minister of cooperative governance and traditional affairs, said the development of special economic zones, in which Chinese companies play a big role, will boost growth of local industries and create jobs for the youth. The South African official noted that revitalizing Africa's industrial agenda will be a major topic at the Beijing Summit of the Forum on China-Africa Cooperation to be held in September. Themed "China and Africa: Toward an Even Stronger Community with a Shared Future through Win-Win Cooperation," the Beijing summit is expected to enable China and Africa to pursue high-quality and high-standard cooperation for mutual benefit and common development. Looking forward, Chinese companies will continue their efforts in promoting the industrial development of Africa. Godwin Muhwezi, communications manager at the Uganda National Bureau of Standards, said that more Chinese companies have applied for permits to establish factories in Uganda and manufacture construction materials and household items. "This means that Chinese certified companies are committed to producing quality products and thereby making a positive contribution to Uganda's industrialization efforts," said Muhwezi. As Chinese firms move ahead, African governments are taking action simultaneously. Raphael Tuju, secretary general of Kenya's ruling Jubilee Party, told Xinhua in a recent interview that his country has created an environment conducive to attracting Chinese investments in its industrial sector. "It is crucial for the country to engage with China and grow our industrial sector that is key to prosperity and job creation for unemployed youth," Tuju said. Tuju said he was especially impressed by China's tremendous achievement in poverty reduction. "There is no precedent in the history of mankind. If China can achieve that, it gives us a flicker of hope," he said.